Digital Transformation – very few understand it, but everyone wants it! Most enterprises have made attempts at adopting digital transformation. They indulge in a mad race without knowing what the course will entail, without recceing the turns and obstacles in the path. As a result of this, instead of observing a digital disruption of their processes, enterprises have disrupted the whole order and created a catastrophic mess for themselves. 84% failure rate is extremely concerning, and at some level it shows how little grasp organizations have of digital transformation. They are blindly following the buzzword, maybe, only to stay in the competition. But, with the outcome in hand, it shows that rather than competing for success, organizations have entered a frenzy of stumble-over-fall-on-your-face failure. A recent Harvey Nash/KPMG CIO survey results further bared the face of this industry-wide sensation. Only 41% of companies have an enterprise-wide digital transformation strategy, whereas only 18% of them consider their digital technology as very effective. 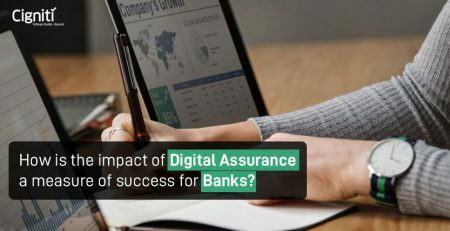 The survey results bring focus on two important aspects that need to be considered for identifying the areas of improvement – one, the apprehension regarding adoption of the digital wave, and two, the gap between the adoption and successful implementation, ultimately leading to failure. Customers are at the heart of the concept of digital transformation. Organizations are expected to utilize their data bank to yield the highest level of customer satisfaction. They need to embark on their digital quest with a data-driven, customer-centric approach. Digital transformation is not limited to revitalization of systems and processes only. It demands a complete makeover of all the elements involved in a business model. Individuals are expected to embrace a new set of responsibilities and play a refreshed role in the growth of their organization. The disaster-struck digital transformation strategies, accounting for the failed 84%, lacked many nuances whose absence consequently led organizations to a downward spiral. Lack of a focused, centralized understanding of digital transformation: Without a consensus on the meaning and purpose of bringing about such a revolutionary shift in the business process, organizations face both direct and indirect resistance form everyone involved. A lack of a mutual understanding regarding the benefits of such a change will ignite a total hotchpotch, with everyone leading their own parallel, unaligned course of the digital transformation journey. Lack of the desired talent pool: There is an industry-wide gap prevalent in the demand and supply of required talent who can effectively facilitate digital evolution of an organization. Breaking the myth that digital transformation will make human professionals redundant, there is an ever-rising need for agile, flexible individuals who can begin afresh and spearhead organizations to their digital success. Lack of a 360-degree strategy: The existence of departmental silos is one of the major roadblocks that organizations face in their digital transformation endeavours. Without breaking these siloed-walls, it is infeasible to create a comprehensive strategy with a holistic view of the entire business process. Lack of such a strategy may prove fatal as the change is applied in bits and pieces, rather than whole. Lack of support from the top executives: The magnitude of change that digital transformation brings requires unwavering, continuous support from the C-suite and executive committee. Without their backing, the digital transformation journey is bound to fail. The modern, agile IT environment has imposed the need for continuous innovation and improvement. The failures of past digital transformation efforts have expounded a few lessons that should be kept in mind while devising a digital strategy for the future. Manage the change proactively: Instead of reactively dealing with resistance to digital transformation, it is only smart to address all concerns, whatever they may be. The direct involvement of top management relays the importance of the transformation journey and attracts more active participation of employees. Removal of data and departmental silos enable organizations to strategize holistically with cross-functional teams and proceed for the battle with an all-inclusive army. Establish a digital discipline across enterprise: One thing that needs to be made absolutely clear is that the responsibility of an organization’s digital transformation success is not of the IT department only. It lies with every single individual, which is why, it is imperative to build and govern digital discipline across the enterprise. Identify key data and prioritize: The sheer volume of data produced, collected, and stored by an organization can be extremely overwhelming. For their digital strategy, organizations first need to identify which data is required and which data is plain garbage. Considering that garbage input data will produce garbage output, it is essential to sift through the data and extract what is required. Then, this data should be prioritized to address the user needs and fuel the customer-centric strategy. Digital transformation is still a relatively new concept across industries. Since there is a lack of established standards to measure the success of their digital transformation strategy, organizations may often feel that they are proceeding blindfolded to an unknown territory. However, there are a few aspects against which organizations can measure and evaluate their standing such as agility with the market, scalability of the digital capabilities, adaptability to the implemented changes, openness to learn continually, and control and management of risks and vulnerabilities. 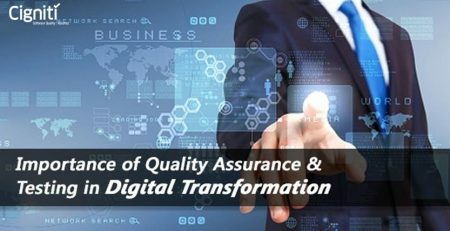 Implementing an effective digital quality assurance at the core of the digital transformation efforts can make a world of difference. With proper QA and digital testing, it becomes easier to analyze the weak points and chart the success of the strategy. Digital transformation necessitates evolution of a company right to its very core. The company ecosphere must be changed, infrastructurally as well as culturally. Active involvement of the top management becomes critical in realizing the enterprise-wide change as they may prove instrumental in eradicating the fear of change among the employees. With their focus centered on customer engagement, organizations should get their employees as well as end users onboard for the disruptive digital transformation. 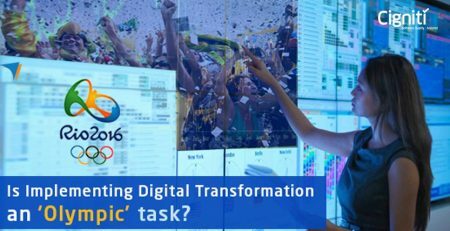 Is Implementing Digital Transformation an ‘Olympic’ task?